The College of the Ozarks has a variety of unique experiences to offer to anyone visiting the Ozarks region. Located near the tourist destination of Branson, Missouri, College of the Ozarks warmly welcomes all visitors to enjoy its beautiful campus. The Museum is located at College of the Ozarks on Point Lookout, which is only two miles south of Branson, Missouri. After your visit to the museum, be sure to check out the many other activities and points of interest College of the Ozarks has to offer. The Keeter Center - Whether you're looking for a casual lunch or an intimate dinner for two, our culinary staff of students at Dobyn's Dining Room offer an exceptional dining experience and something for every taste. Don't miss Sundays, featuring our award-winning Brunch, and for the sweet tooth anytime of the day, our bakery will satisfy any desire with pastries, cookies, and a variety of coffee and specialty drinks. Also, visit our College Creamery and enjoy student-made ice cream made with our own fresh dairy cream. 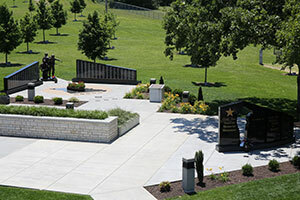 Patriots Park - The park sits near the entrance of campus and contains The Missouri Vietnam Veterans Memorial which bears the names of the 1,410 men and women from Missouri who gave their lives in Vietnam. Patriots Park is also home to The Missouri Gold Star Families Memorial which honors Gold Star Families (those who have lost immediate family members in their service to the country), preserves the memory of the fallen, and stands as a stark reminder that freedom is not free. 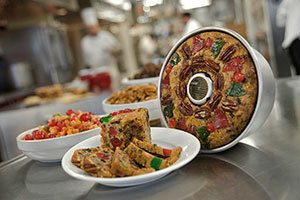 Fruitcake & Jelly Kitchen - Since 1934, College of the Ozarks has produced its famous fruitcakes on campus, and today student workers, along with supervisors, bake more than 25,000 cakes a year. Visitors are welcome in the kitchen where a variety of jellies and the College's delicious apple butter are also made and sold. 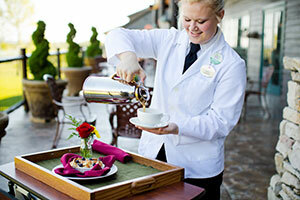 The Kitchen is open for public tours from 8 a.m. to 5 p.m., Monday through Friday. Edwards Mill - Built with funds provided by the late Mr. and Mrs. Hubert C. Edwards, is powered by a twelve-foot water wheel turned by runoff water from nearby Lake Honor. Student workers grind whole-grain meal and flour, available for purchase inside the building. Upstairs is a weaving studio, where students design and produce rugs, shawls, placemats and other items on traditional looms. Downstairs, students hand-weave baskets. 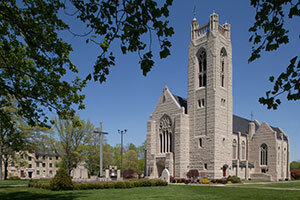 Williams Memorial Chapel - The Chapel is an outstanding example of neo-Gothic architecture. The structure, dedicated in 1956, measures 150 feet long and 80 feet wide, with an 80-foot-high vaulted ceiling and impressive stained glass windows. Attached to the chapel is the Hyer Bell Tower. Sunday services beginning at 11 a.m. are open to the public. The Gaetz Tractor Museum - The museum features a variety of antique tractors and farm equipment. Noteworthy items include a gray Wallis from 1918 and a reaper produced in 1910. The Hoge Greenhouses - Located east of Edwards Mill, the greenhouses are home to the Clint McDade orchid collection. Mr. McDade, one of the School's first students, donated the nucleus of the collection, which today numbers more than 7,000 plants. Individual orchids and other houseplants are for sale at the greenhouse. The College of the Ozarks Bookstore - The bookstore offers College of the Ozarks and Hard Work U. logo items that can be purchased to show your support for College of the Ozarks.